Hi girls, I’m taking some time off to enjoy these summer days with my family while everyone is here. My son and I were looking at photos today that I have taken and he suggested I blog them to share with you a part of our tropical life here in Tampa. Above is a photo of our backyard. We live in the northeasterly corner of Hillsborough County in a subdivision called Tampa Palms. We literally live in a swamp. Our neighborhood was a swamp 20 years ago. Fill dirt was brought in and the houses are elevated above the level you’re looking at by about eight feet. Our backyard gently slopes down to what you see here. 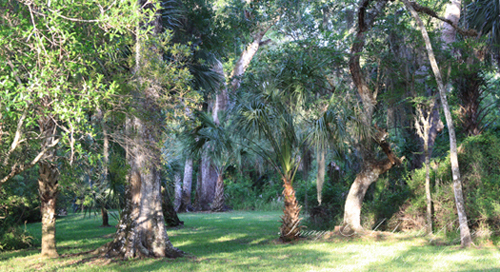 It’s very tropical and beautiful with water oaks and native palms. A few of our neighbors thinned out the undergrowth on their lots, but most of us chose to leave the property in its natural state. I’m a native Floridian and have lived here my entire life (with the exception of four years in New Orleans while my husband was in school). As a child, my backyard was very similar to the backyard I now have. I have many memories of playing in the woods with my brother. My childhood woods were not a swamp and were safer (I think . . . LOL!). I did not allow my boys to play in these woods, they’re filled with alligators, water moccasins, snapping turtles, wild boar, deer, wild turkey, raccoons, opossums, owls, etc., all of which have made their way into our yard at one time or another. I think we have just about everything in our swamp, except Shrek. This is Georgia, she’s my pride and joy. 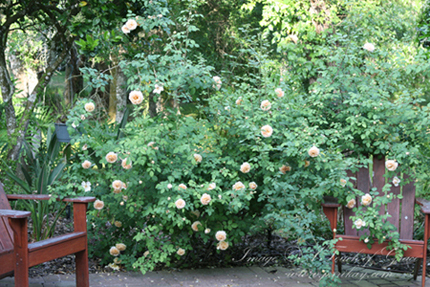 Georgia is an English Rose, a David Austin variety. Her official name is Teasing Georgia, I just call her Georgia. She’s massive! This Spring she had over 500 blooms. She just started blooming when I took this picture. She’s well over 8 feet across and at least 6 feet in height, if not more. This is one of Georgia’s babies, isn’t it gorgeous! 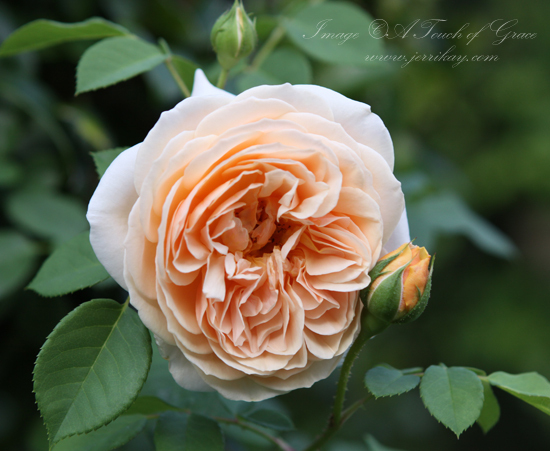 Her color is a creamy apricot and her fragrance is divine! A mature bloom; it’s absolutely stunning in its perfection! There was a bee inside this rose. After taking a picture I noticed it moving around and shook it out and then shot this photo. 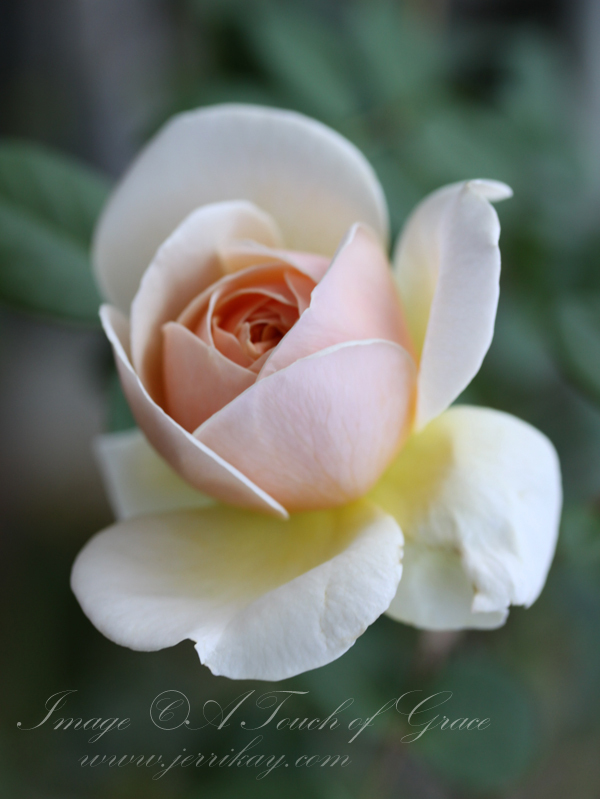 I love the small bud hugging the mature bloom, so sweet! 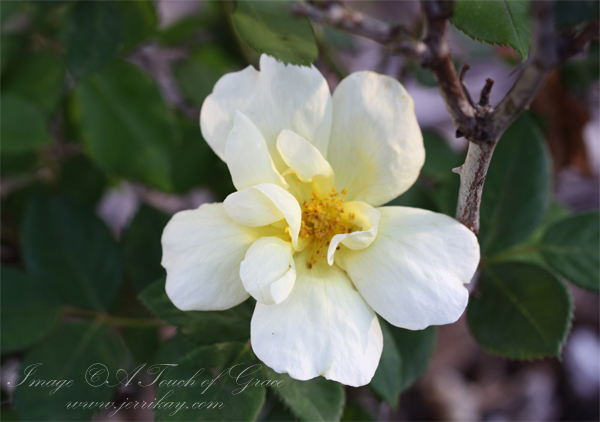 This is a sweetly fragrant rose that grows at the front of my house. I have nine bushes that grow directly adjacent to the portico. It’s a yellow version of Knockout and I can’t for the life of me remember the name of it. I was told it wouldn’t have a fragrance, but it does. When all nine are blooming, the front entrance of my home is engulfed with the sweet fragrance. They bloom continually, some weeks with more blooms than others. 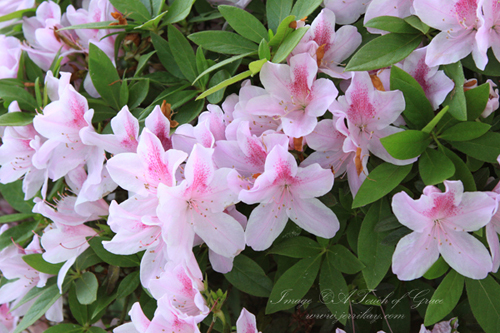 We have beautiful Azaleas as well. This year’s crop was profusely spectacular! I love this photo, another one I wanted to share. Doesn’t it took like the stamens are floating in thin air! 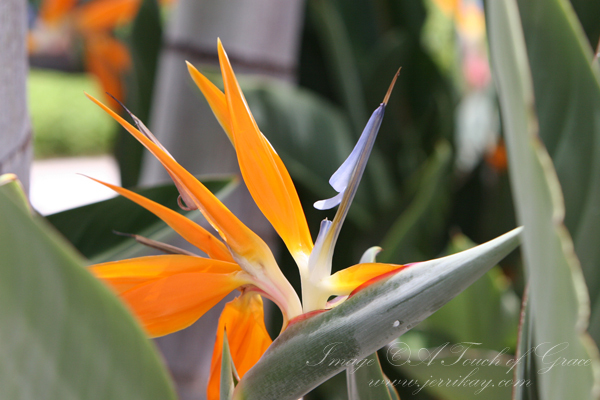 I couldn’t not provide photos of my Bird of Paradise, I mean how tropical is this!!! They don’t have a scent, but their beauty more than makes up for it. I have three plants surrounding a Foxtail Palm. We had many blooms on this plant as well. A close up to show you the vibrant beauty of this tropical flower. The Father’s Day cards I made were inspired by our tropical plants. 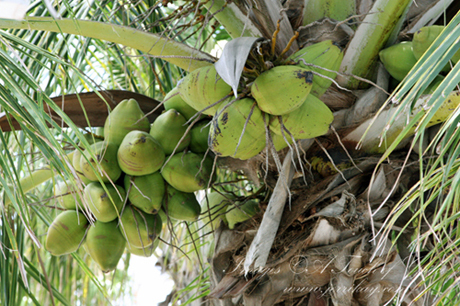 This year our coconut trees are abundantly providing us with fruit . . . did I mention that I cannot stand the taste of coconuts . . . LOL! When one of those babies drop: look out below, they’ll crack your skull! Fully mature they’re about 9/10 inches in height and 6/8 inches in width. They are hard and heavy. The outer shell turns brown, nearly the color of Almost Cocoa. When cracked open, you see the coconut that you see in grocery stores. That shell has to be cracked upen as well. Way too much work for me . . . LOL! My hubby drills holes in them and they (he and his mother) drink the milk. Our tropical hibiscus is a favorite of mine. This beauty is a double ruffle. The mature blooms span 5/6 inches across and are quite bold in color. 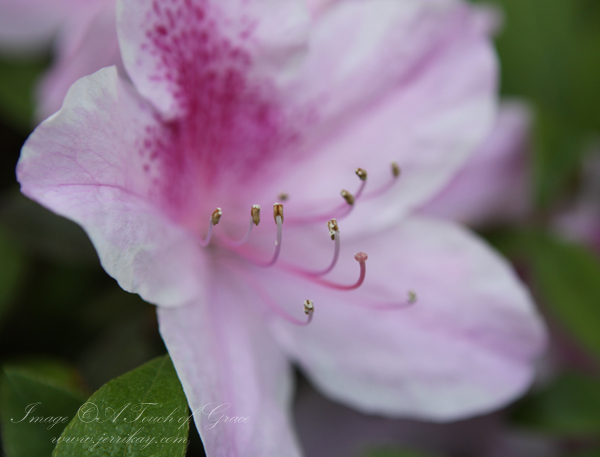 It’s hard to see the stamen in this photo, it blends in with the bloom. It’s thick, the tips are a velvety red. 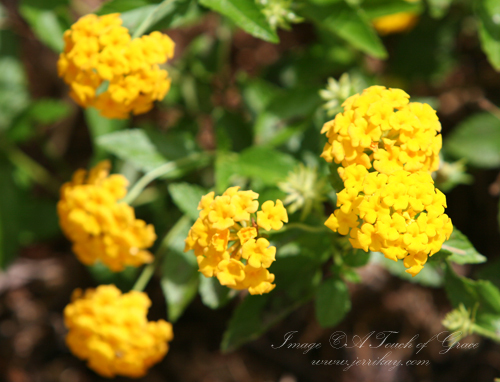 I’ve grown up with Lantana. We keep it planted because it stinks and keeps some of the bugs at bay. It comes in several colors, as well as multi-colors. I like the bright yellow. 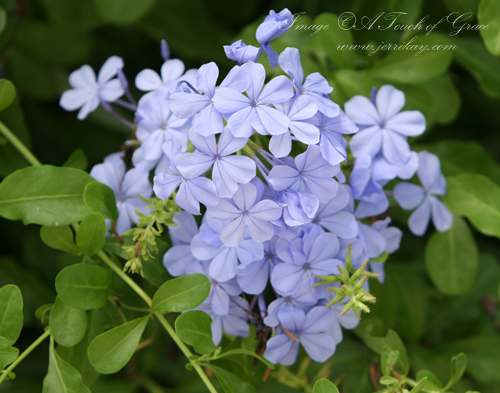 Another plant that I use as a hedge is Plumbago. It flowers profusely throughout the Spring and Summer, creating a beautiful hedge when pruned properly. It’s gorgeous planted beside bright fucshia Bougainvilla. My Bougainvilla was hit hard with the winter freezes this year, I don’t have any pictures to show you of it. I lost my orchids this year. I had several beautiful plants on my patio that were attached to Christmas palms. We also lost six of the Christmas palms. We had several nights of below freezing temps this winter and no amount of covering saved them. 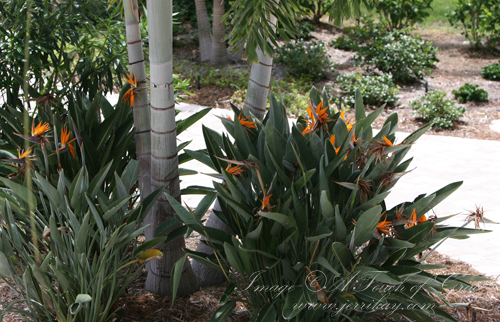 We’re in the process of replanting those palms and will be looking for orchids as well. Once it’s finished, I’ll provide poolside pictures. I now realize I forgot to take pictures of my Crepe Myrtles. I’ll include those when I get the patio finished. I can’t remember a time when I wasn’t gardening. My brother and I had a lawn mowing business when we were kids. My mom loaded our lawnmower in the back of our old station wagon and drove us to our customers’ homes. We mowed two lawns a day, five days a week all during the summer. Back then we mowed lawns for the retirees that came to Florida for the summer months. As we grew into our teen years, my brother moved on and worked with my dad in his auto repair business. 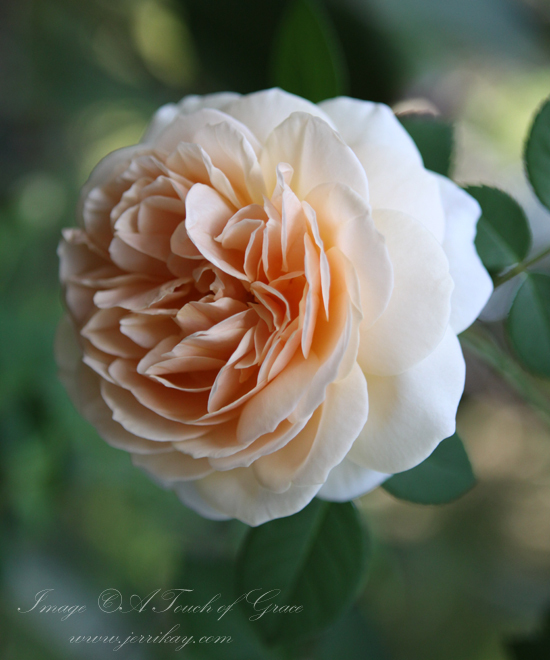 I then had the care of our lawn and started tending my first roses at the age of 14. I can’t remember a time I didn’t have a passion for flowers and for gardening. My love for all things floral spills over into my creative designs. Well, that’s it for now. I’ll try to get up to my stamping room soon to start work on new designs. I hope you’re enjoying the warm days of summer with your families. Thank you so much for stopping by for a visit. Jerri, I love your pictures!! I could dream in each and every one of them. Your photography skills are great, too, in order to show each flower in such detail! Can I come relax in your yard some day? I won’t be a bother, ha! [I live too far, don’t take me seriously here.] Your gardening skills are amazing and I thank you for sharing them with us today. Have a blooming beautiful day!! Thank you for sharing your beautiful garden. You have such beautiful flowers and foliage. Apart from the roses, they are so different from the flowers we have here in our much colder climate in the very south of New Zealand. Have a wonderful time ith your family and enjoy them. Oh my, what a wonderful visit to your beautiful gardens, Jerri!! Thanks so much for sharing with us. Jerri, thanks so much for inviting us into your gardens. I particularly love your bird of paradise, it’s quite spectacular! Oh, and my bougainvillea didn’t survive the winter either. 🙁 I didn’t have as many plant losses from last winter as I did the previous 3 years from the drought we had. Have a magnificent summer, and enjoy your time with your family! Can’t wait to see your next designs! Jerri, what awesome pictures. Your place looks like a park. Absolutely breath taking!!! Certainly different than northern Indiana. I love it all! Hi Jerri, I’ve been a follower of your blog for some time now and really enjoy seeing your beautiful creations. I was born in Tampa, but now live in Alabama. I lived in Brandon as a child and still have relatives in the Valrico area as well as Dade City. 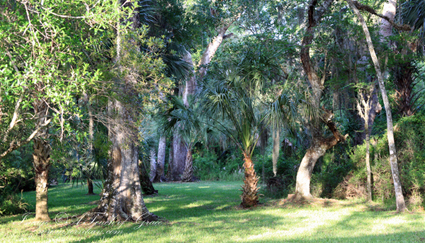 One of the things I love about Florida is the lushness of the flowers, plants and trees. Thanks for sharing photos of your beautiful yard! I love seeing your beautiful flowers. I too, have always loved to garden. I moved from CA to TN 4 years ago and have had to learn gardening all over. If my gardens looked even a bit like yours, I would find it very difficult to stay inside and craft! WOW! What great photos. What camera do you use? I admire all your skills! Thanks for sharing – for awhile this morning I was transported to a different place. : ) Hugs!! How beautiful, serene and fragrant. Thank you so much for sharing these. What a wonderful way to start my day. I loved your pictures. Scarry with all those critter to pop in your backyard! Not for me, but the beautiful flowers…that’s another story…gorgeous. I do see how you are inspired by the beauty of the flowers. You are a natural with them. Thank you for sharing. Jerri, thank you for sharing another side to your creative passion. I so enjoyed seeing your beautiful garden, including the mysterious swampy areas. The roses and azaleas are amazing! I too have had a lifelong love of gardening. I believe I find solace when my hands are working with the earth, as well as with paper crafts. Beautiful shots Jerri! What a beautiful calendar the closeup floral shots would make! Thanks for sharing your photos with us! Your yard is fantastic with all of the beautiful florals! I wouldn’t want to leave it! Tks! Loved seeing all your garden pics–I also live in FL. in an area that was all swamp on the east coast–and had to laugh to myself when hearing you also have all the wildlife around you–we retired here ten yrs. ago and it took me awhile to get used to all the wildlife. 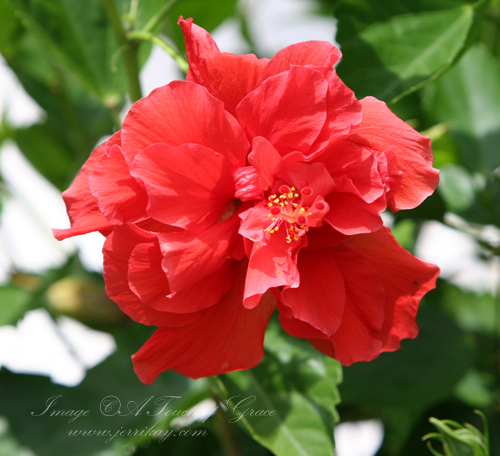 Your hibiscus is beautiful–I’ve tried many times but gave up with them as the deer eat them leaving me only a tiny stalk to look at–thanks for sharing all these beautiful pics. Jerri, your “swamp” is an “eden”! How relaxing and peaceful it must be. Those colours are inspiration for so many cards and ideas…. Thanks for the trip down memory lane…I was born and raised in Miami, FL…I had forgotten about some of those lovely flowers!!! Your roses remind me of your wedding collection!!! Now I live in Salem, OR and they have flowers everywhere…iris, dalias, fuschia, roses, and the list goes on! Love all the flowers!!! Love the flower photos. Thank you for sharing them. You seem to love the same things I do and your blog feels like a visit with a dear friend. I sooooo love your flowers and yard. I also have always been a flower grower as the results are always worth it, even tho we don’t have a long growing season. (SD). Thank you for sharing, and if I had a yard like this I wouldn’t get much done in the house. ha. Thanks for the beautiful pictures. We were at FC 40 years ago and lived just across the Hillsborough River on the other side of the campus. Your flowers are absolutely beautiful. Thanks for sharing. Jerri I could only dream that I would ever have a yard like this! It’s absolutely gorgeous and between your gardens and Leslie Miller’s I could be lost for months. Gosh, why am I not surprised you live in such a beautiful surrounding. Everything you do is so elegant. Your roses are gorgeous. It’s funny how you started gardening so young, and to have a passion for roses at 14 is amazing. I think your back yard is cool; it’s just too bad that the bad guys live in there. I live in Canada, one hour away from Detroit, so you can imagine the snow we get, and because we live in cold settings, our flowers aren’t as beautiful in the summer. I do have roses but they don’t last too long. What a tropical paradise you live in, Jerri!! Thank you for sharing everything. My favorite is your Georgia Roses!! I can see why you didn’t allow the boys to play out back, though. Yikes!! What a beautiful place to love, Jerri…I just love all your flowers but Georgia is Spectacular!!!! Your backyard not only looks beautiful but I bet it smells good, too!!! Now about all those varments….yikes!!! I’m glad they stay where they belong most of the time..LOl!!! I guess I’ll stop complaining about the ants!!!! What a lovely, inspirational surrounding you have. It’s no wonder the flowers you create are so life-like -you haven’t far to go to see them in their natural habitat! I’ve seen Lantana (didn’t know it came in different colours) but am new to the Plumbago. How pretty is this?! It reminds me of hydrangeas with their gentle hue. Living in an apartment in Canada is limiting flower-wise, but I try. I have a gorgeous wee pink rose blooming like crazy right now and am awaiting my Sweet Peas. One of my window-box faves is Nasturtiums (les capucines). I have 3 varieties and all are blooming with such abundance. Their colours are spectacular! They prefer dry rocky spaces but not sure if you can grow them in Florida. This looks like absolute Heaven to me! Oh, to see this when we’ve had such a rainy, foggy Spring — I could cry, but the beauty of your photos and your descriptions move me to tears just for the beauty of it all, too. Thank you so much for sharing, Jerri! It was delightful! Your flowers are gorgeous as well as that back yard. Wonderful pictures of your son’s. Wow Jerri, No wonder you make such beautiful things. You are surrounded by the beauty of nature, and the wonderful colors! Thanks for sharing the pix. Also I must say that your fellers are handsome! As are mine… I have a soft spot for boys, as I raised 2. And they turned out to be quite handsome men. Thanks for sharing those too.